Home / Employment and Social Affairs / What are the most innovative countries in the EU? What are the most innovative countries in the EU? What are the most innovative countries in the EU? On 14 July 2016, the Commission released the 2016 results of the European Innovation Scoreboard, the Regional Innovation Scoreboard and the Innobarometer. On 14 July 2016, the 2016 European Innovation Scoreboard, the Regional Innovation Scoreboard and the Innobarometer were released by the Commission. As shown by these three reports, Sweden is once more the most innovative country in the EU, followed by Denmark, Finland, Germany and the Netherlands. “Leading countries and regions are supporting innovation across a wide range of policies from investment to education, from flexible labour conditions to ensuring public administrations that value entrepreneurship and innovation,” said Carlos Moedas, Commissioner for Research, Science and Innovation. However, other countries are growing fast in terms of innovation. Those that are the fastest growing innovators are Latvia, Malta, Lithuania, the Netherlands and the UK. As shown by the findings, Sweden is once a the most innovative country in the EU, followed by Denmark, Finland, Germany and the Netherlands. Although Sweden is still the best for the quality of academic research, different EU countries take the lead in some areas of innovation. For example, if Finland is the most innovator country in terms of financial framework conditions, Belgium is the top performer for Innovation networks and collaboration. German companies are those investing the most in innovation across Europe while Irish small and medium-sized companies are introducing more innovative products and generating more new jobs than everywhere else in the EU. The annual European Innovation Scoreboard also offers a comparative assessment of the research and innovation performance of the EU countries and selected third countries in order to help them assess areas in which they need to concentrate their efforts to boost their innovation performance. 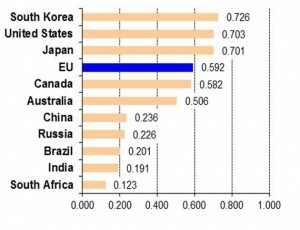 In terms of innovation, Japan and the US are overall caught up by the EU, which is still maintaining a performance lead over Australia and Canada. As for Brazil, the Russian Federation, India, China and South Africa, this extent is even greater. With the exception of China, which keeps reducing its gap by growing faster than the EU, the lead of the latter is stable or even increasing over all countries already mentioned. The innovation performance of European regions is assessed in the Regional Innovation Scoreboard, a regional extension of the European Innovation Scoreboard. The most innovative regions are typically those in the most innovative countries. Despite excellence is concentrated in relatively few areas in Europe, regional innovative hubs could also be found in some member states, mainly larger countries, such as Piemonte and Friuli-Venezia Giulia in Italy or País Vasco in Spain. The Innobarometer is meant to reveal recent trends and attitudes in businesses’ innovation-related activities in both EU countries and third countries, such as Switzerland and the US. 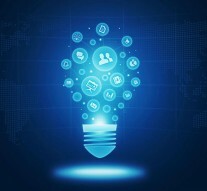 The 2016 Innobarometer survey is conceived to gather data on companies and innovation, such as their reasons to invest in innovation; the barriers to commercialisation of innovations and need for public support that they perceive; the way they use design as a driver of innovation and progress towards industrial modernisation. In particular, this year survey focuses on the type of skills that innovative companies need. The EU’s innovation performance will supposedly improve over the next two years, since a majority of companies plan to maintain or increase the level of investment in innovation over the next year. « Previous Article How do Member State comply with EU law of Single Market?